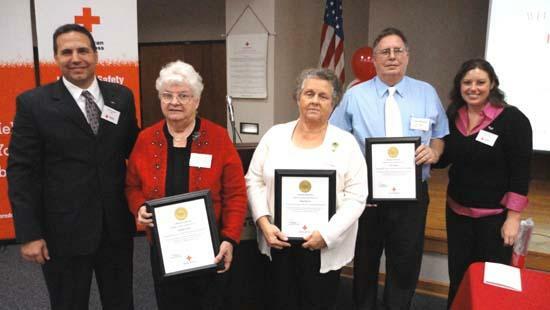 On Thursday, Oct. 28, the Tennessee Valley Blood Services Region of the American Red Cross honored its “Hometown Heroes” with a luncheon and awards ceremony. Carl Hirlston, of Woodbury, Tenn., received the Outstanding Volunteer Award. The award is given to volunteers who go above and beyond the call of duty in helping the Red Cross serve their communities. The Tennessee Valley Region Donor Recruitment Department nominated numerous individuals, businesses and schools. From those nominations, 24 award winners were selected. Congratulations Carl! Thank you for your dedication to the American Red Cross blood program. My neighbor and friend Carl Hirlston gives 150 percent to everything he does. While the Red Cross has honored him as one who goes above and beyond the call of duty in helping the Red Cross, the fact is -- going beyond what is required just seems to be part of Carl's personality. Congratulations Carl -- You are a very good person and an asset to Cannon County.